Two men appeared: Moses and Elijah came; they were at his side. Then there came a word of what he should accomplish on the day. A cloud appeared in glory as an accolade; they fell on the ground. A voice arrived, the voice of God, the face of God, covered in a cloud. What he said to them, the voice of God: the most beloved son. Consider what he says to you, consider what's to come. The prophecy was put to death, was put to death, and so will the Son. Lost in the cloud, a sign: Son of man! Son of God! As humans seeking God, our great challenge is to keep the faith. We have been given free will to exercise for good, which is an extremely difficult task, but God created us for this purpose. On some days Christ might appear to us transfigured, clothing all aflame, with God's voice booming down in affirmation. But much of the time God's face seems veiled, as with a cloud. The Truth makes so much sense, but who among us has the fortitude to cling to Him despite our endless trouble, fear, doubts and our nagging weaknesses? We might construct a tabernacle for ourselves, as Peter suggested to God, to shore up our faith. Maybe hardened brick and tradition piled on top of each other would give us a predictable point of reference, in case God's face seems veiled. But this is misguided. Such thinking compromises our mission, which is to live and die for Christ. We are dying already; we can't avoid death. The question is, what are we living and dying for? We struggle against discouragement and doubt, but not without purpose. Christ Himself is our Edifice. His is a difficult Way in that He does not make room for fleshly compromises. But, if we trust Him to maintain our faith and our daily sanity, then and we won't have struggled in vain. The fact that God's face is covered in a cloud so much of the time is strategic. This relates to our purpose for existing, which is to seek Him despite our limited perspectives. We will inevitably struggle, but everyone struggles. If we are following after Christ as we go, then we struggle with heavenly purpose. So, in the mean time, let's keep singing songs that remind us of God's glory such as this one by Sufjan Stevens, especially during those times, as he said, when God seems "lost in the cloud." Great post! Which Sufjan album is this song found on? Thanks for the info, I will have to pick up the Seven Swans album. I think Sufjan has a few albums out actually. The only Sufjan album I have is entitled "Illinois (Come on Feel the Illinoise)". If you get a chance you should give it a listen. Would love to hear your thoughts on some of the songs on that album. 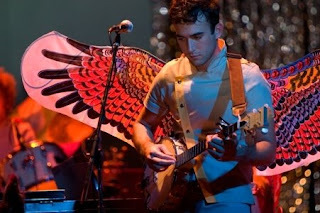 Oh I really enjoy a lot of Sufjan's stuff --- nice post. Sufjan has had a handful of albums Illinoise, and Michigan. And even a Christmas album. I really enjoy Illinoise --- especially the song "Chicago" from that album. Have you had a chance to tackle anymore Sufjan?